Original valve cover for Chinese-built GY6 4-stroke 139QMB/QMA engines. The cover is dispatched without an SLS connection [secondary air system]. This means it can be used as a replacement for defective original items, or to blank-off the SLS. This makes the engine quieter and helps it perform better. When installing, you need only change over the crankcase breather hose [small hose with angled connector]. The valve cover gasket is NOT included. When removing the valve cover, we recommend changing the gasket. 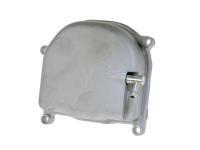 101 Octane are high quality QMB139 GY6 parts and accessories. You can buy with confidence for 101 Octane is one of the best parts brands we offer.